This photo was taken before I blocked the cardigan. 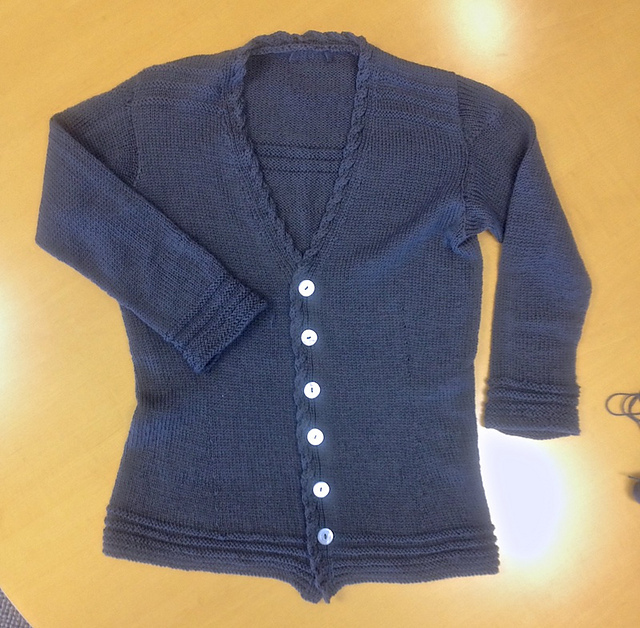 I finally finished my first Andi Satterlund cardigan pattern and it is PERFECT. It fits me beautifully. Everything worked out great. I love it. Its a very retro looking caridgan but its knit up in worsted weight yarn so it knit up quickly. I knit up the Myrna cardigan in more of the discontinued yarn that seems to make up most of my stash these days, the Classic Elite Summer Set. Summer Set is a cotton blended yarn that reminds me a lot of Classic Elite Premiere or Brown Sheep Cotton Fleece. I had just 665 yards of the Summer Set which was JUST enough to complete the cardigan. I had about 50 yards left even though I made the cardigan a bit longer than the pattern originally recommended. I probably added a couple inches to the length and it hits just at the top of my hip bones. Still, its a cropped cardigan and the shaping worked out super flattering. I was sitting on posting this on the off-hand chance I got a photo of me wearing this but time is of the essence so I’ll post this with just the flat photo and hope that’s enough to inspire you to try one of Andi’s excellent patterns. I know I will be knitting more of her designs soon! In January, I tackled a couple scarf patterns. 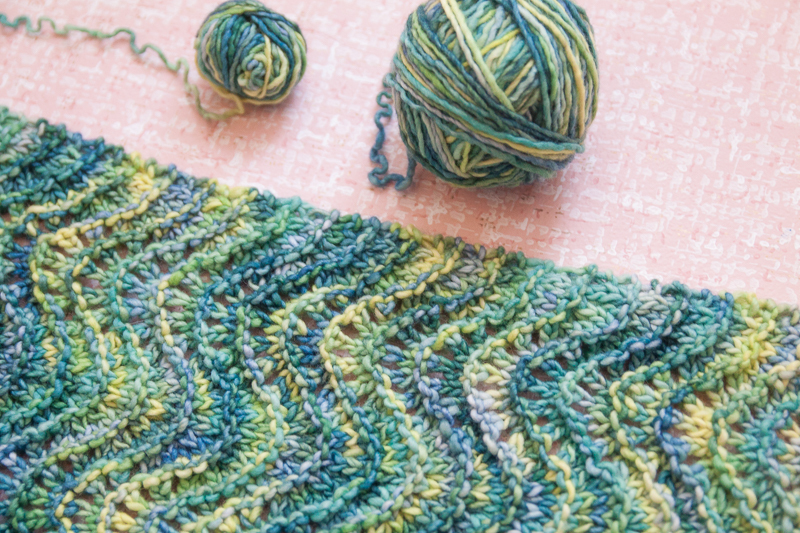 I started with the Japanese Wave Pattern which is a very simple lace design that created just enough texture to keep the pattern interesting but not so much as to compete with the handpainted yarn. 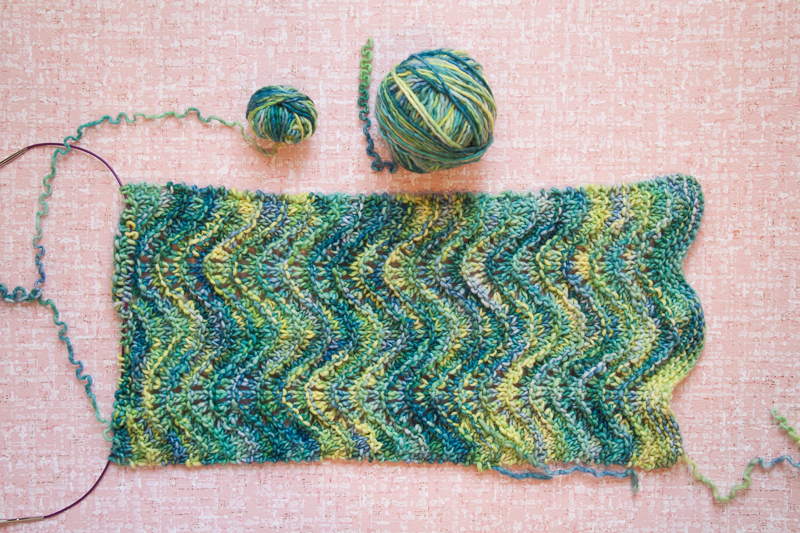 I used one ball of Malabrigo sock yarn in the colorway Rayon Vert. I titled the project Marsala Waves since the yarn was very much the same color as Pantone’s Color of the Year for 2015. I knit until I was out of yarn and it ended up being at least five feet long. I sent it to one of my pen pals as a gift and I do hope she likes it. The next scarf I knit was a simple Feather & Fan design that was made from frogging a Purl Ridge cowl whose bind-off was too tight and the whole thing rolled most unappealingly. I ripped out the cowl and then just re-knit it in the Feather & Fan pattern until I was out of yarn. It ended up being about three feet long after blocking so despite the modern handpaint colorway, is about the size of a vintage neck scarf. I’m certainly more inclined to wear it now than in its previous incarnation. The yarn is quite soft but I’m inclined to overdye it for a more consistent color. I think I’d wear it more if it were more solid in color. While I was under the weather last week, I took a break from working on my vintage NaKniSweMo sweater with the bobbles and worked on a few projects that were simple and pretty brainless for the NyQuil-haze. My husband was asking for new handwarmers so I found some black Shepherd’s Shades in my stash and matched it with the Toshette cabled mitt pattern and then I added pots of tea and lots of silly TV watching and voila! Manly twisty dark mitts! I added the thumb gusset per Maratini, alternating the increase for the gusset with a plain row until I had about 11sts between the markers. I also added an extra repeat of the cables above the thumb to cover my husband’s long fingers. He hardly takes them off and now they are civered with cat hair too. Darn black yarn! 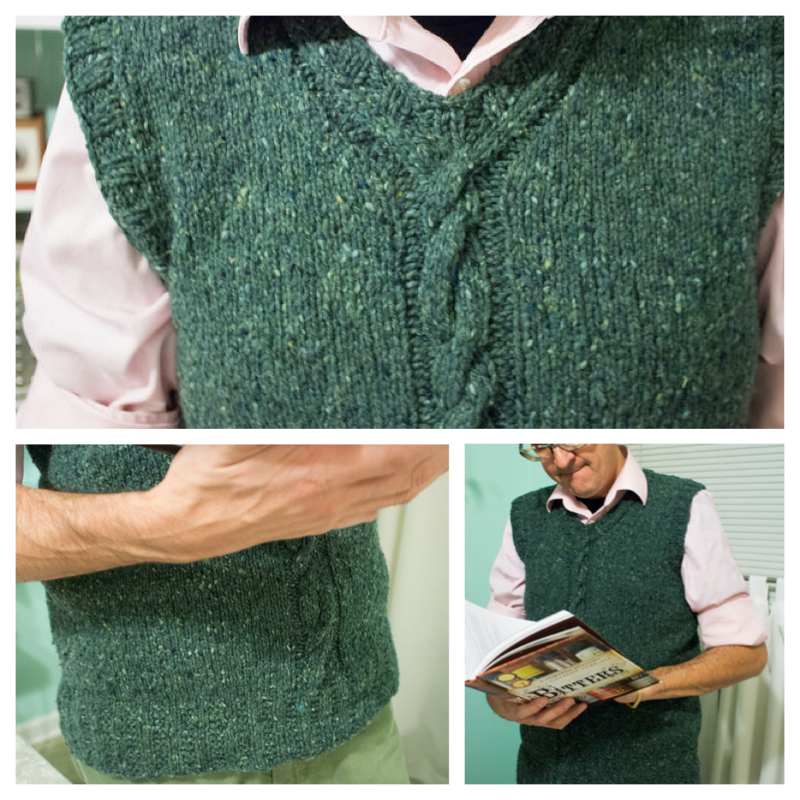 Earlier this year, I attempted to make a vest for my darling husband from a pattern in Nikol Lohr’s book called Literary Knits. I made the Sal Paradise Vest but, in the end, Bob felt like the neckline was too low for his tastes. Because of the unusual construction of the Sal Paradise Vest, top-down from the neck, I couldn’t frog back and fix it without disassembling the whole vest. As a result, I decided to use a different pattern to remake the vest. I used the Matthew’s Vest pattern from the Green Gables Knits book. Matthew’s Vest in knit in the round from the bottom up and I love the way the cable wraps around the neckline. I think the new vest turned out really well. 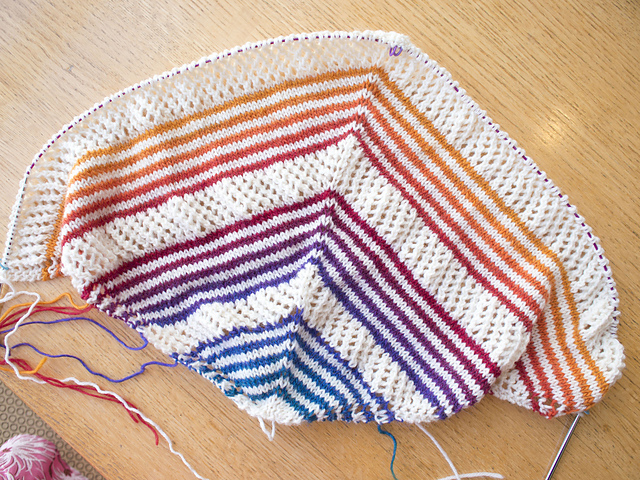 The cable was just enough fun to keep all the stockinette from getting too boring. 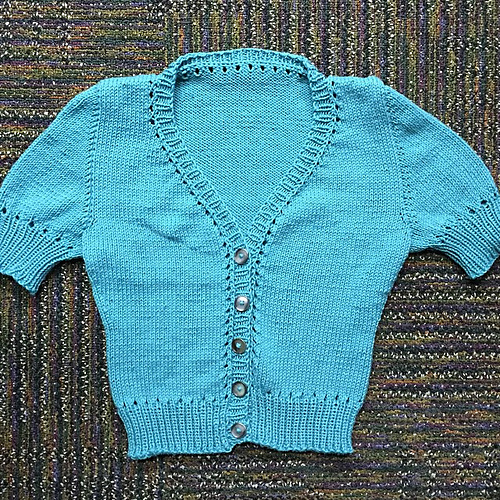 The ribbing at the bottom is a sort of mistake rib and the ribbing on the neck and arm holes is a standard ribbing with a knit bind off, instead of in pattern which helped to pull the edges in since the ribbing was not done on smaller needles.